Wire the transformer as shown to the pre-amp input connector and the cartridge. It is a good idea to twist the two primary leads together to form a "twisted pair" and do the same with the secondary leads. Keep these leads as short as possible. Connect the (Black) lead from the transformer to the ground part of the preamp input connector. 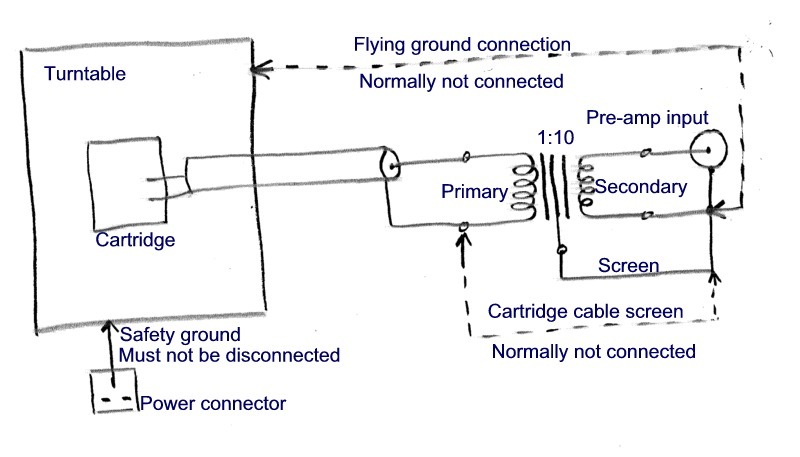 If there is a safety ground connector associated with the power cable do NOT disconnect this. If there is a flying lead connecting the metal parts of the turntable to the chassis of the pre amp you can try disconnecting this. Do not connect the cartridge cable screen to the ground of the preamp. If you have a hum problem you can try making this connection but normally it is not connected. You can also try disconnecting the Screen wire (Black) but this is normally better connected to the preamp ground. If you still have hum problems you can see what happens if you disconnect the primary of the transformer. If the hum goes it must be coming from the turntable. You can also try disconnecting and "shorting" (connect together) the primary leads. If you still get hum when these leads are shorted the hum could be from the amplifier. You can confirm this by unplugging the transformer altogether. Finally. Be assured that your hum problem can be solved! Try all the above again and perhaps combinations of the various grounding options. You will get a "feel" for what is wrong and eventually you will be able to get it working nicely.